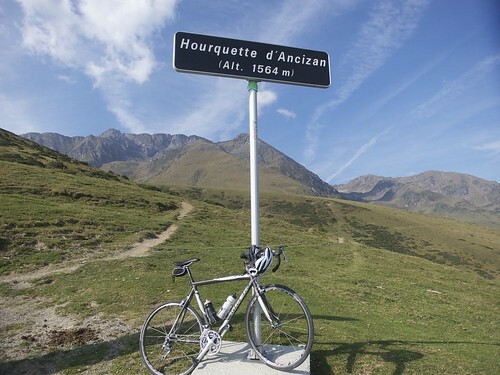 The route to Hourquette d’Ancizan made its first Tour de France appearance in 2011. This quiet, narrow road can act as an excellent alternate route to the Col d’Aspin which is in the Tour more often than not (66 times!). Hourquette is old Gascon for “fork” and is is often used in the Pyrenées to designate a col (a “Y” shaped gap). I climbed the east side from Ancizan. It’s mainly in the trees with an occasional view here and there. At the col the world changes. The other side is completely bare, no trees and virtually no development either. I found it the far more beautiful side and a fun descent. 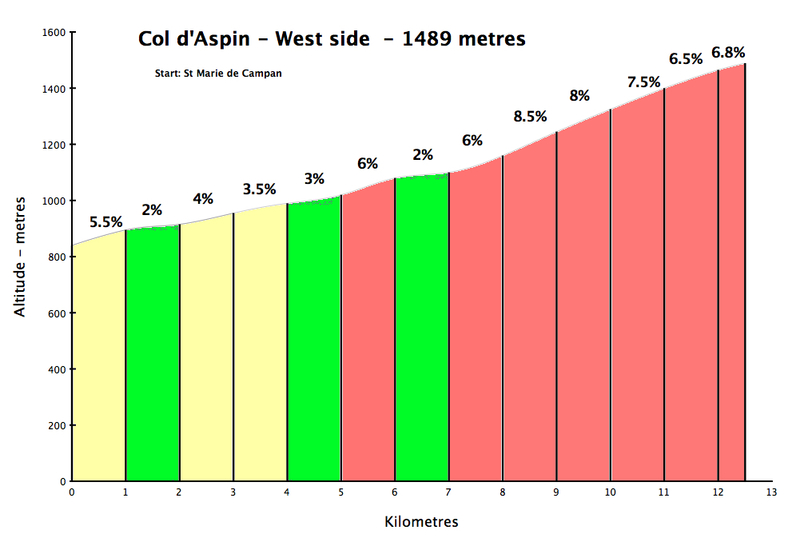 The route joins the road to Col d’Aspin only 6 or so kilometres from the Col. Purists can descend to Campam or Bagnères and cycle the entire west side of Aspin. Me? 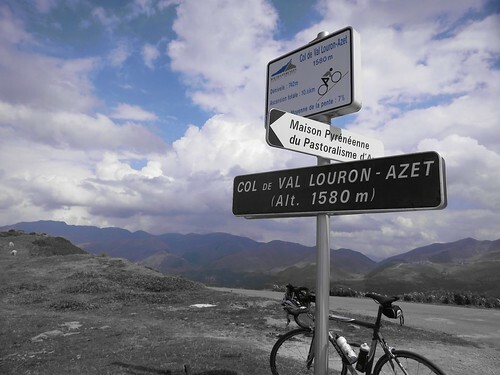 I started up Aspin for a couple of kms then took a badly paved detour to vist Col de Beyrède. Frankly I can’t recommend it. The best I can say is that the road used to be paved. I looped back down to Aspin on a crazy steep road +20% at times. Time to tighten my brakes. 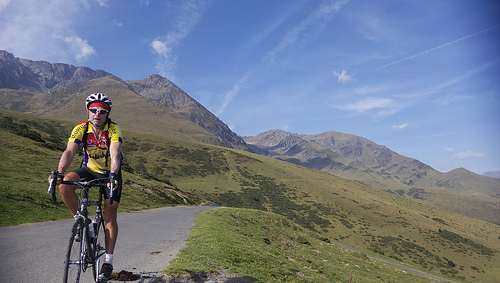 I like Aspin a lot and enjoyed the ascent with some Kiwis (I’d end up having dinner and beers with them much later). Again, I think the side I descended here might be the better side. It’s another rare Col where one can see the top from the very bottom. Plenty of sweeping hairpin views. After descending Aspin and lunch in Arreau, I headed towards the Val Louron. 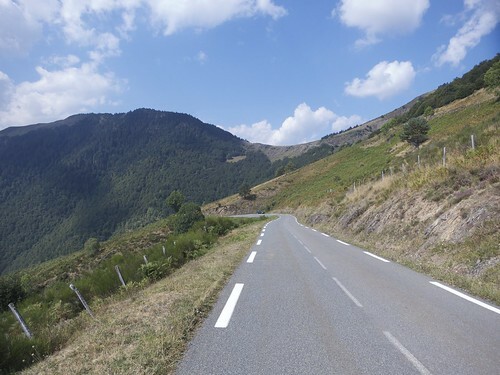 At this point is the option to add the ancient Col de Peyresourde to the loop if you like. 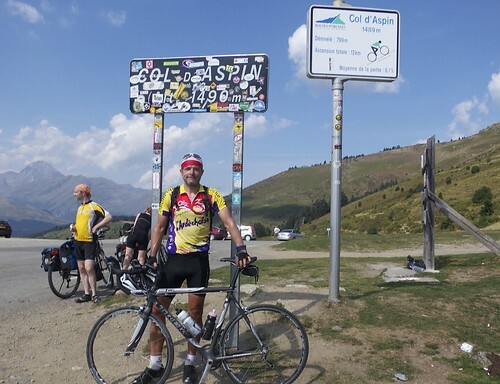 I was too tired, so headed directly towards Génos, the start of the climb to Col d’Azet. 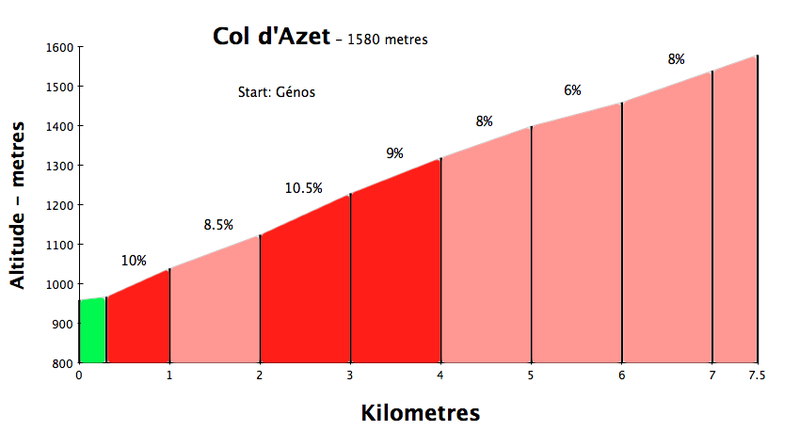 Col d’Azet has appeared 4 times in the Tour, First in 1997 with Pantani leading over the summit. 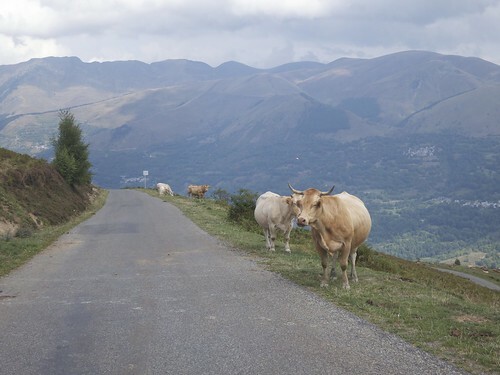 I’d never heard of it, but it’s a good, medium climb, with plenty of hairpins, mountains views, cows, etc – and extremely quiet. From the Col it’s nothing but downhill back to the start point in St-Lary. Nothing too extreme, but this is a thoroughly enjoyable loop. We seem to have taken up synchronised writing. We did the same loop (minus the Beyrede) except that we started and finished in Arreau. I just wrote about the ride today and I agree with you. It’s a most beautiful loop! Col de Beyrede is complete tarmaced from opposite side and very quiet road, but not scenic as nearby cols Azet, Aspin and Horquette Ancizan.